Smiddy Wood is located alongside the main entrance to Applecross township, and close to the main centre of population in the area. A seven hectare area of coniferous forest was felled by the Applecross Trust in 2005, but the brash and stumps remained, creating an unsightly appearance in an area which was important as a welcome point for visitors to the area. 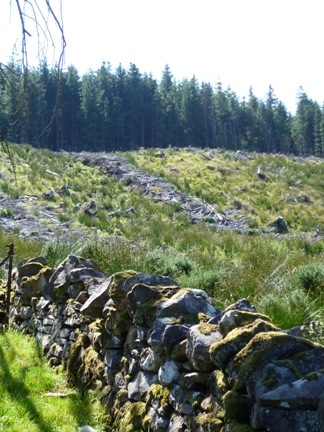 The felling of the conifers also revealed a pre-afforestation settlement pattern with stone dykes, and the location of the old township of Achincork. This project sought complete the clearing of four hectares of woodland by mulching the stumps and providing a pleasant outlook as well as a good environment for new woodland and meadow. This also included seeding of a grass parkland, and planting of native tree species (along with associated drainage, cultivation, fencing and management). Several years on, Smiddy Wood has new native woodland, open parkland and is a welcome view on entering Applecross. The project was linked with other heritage projects such as the restoration of Smiddy Dykes (which line the main road adjacent to the felled woodland), and the installation of the Archaeology Trail, which runs alongside the woodland. Through the Interpretation programme, an archaeology booklet was produced which includes Smiddy Wood and the natural and cultural heritage features within that area.